This was a proposal for thirtyfive turbines each more than 130m tall, located 3km due west of the historic Royal Burgh of Lauder, adjacent to Lauder Common. The number of turbines was reduced to 29 and subsequently to 24. The developers are a consortium of three companies led by `Community Windpower Ltd', a private company based in Cheshire who have deveoped a number of wind power stations throughout the UK, including Aikengall in East Lothian. This is a Section 36 application to Holyrood. Scottish Borders Council are a statutory consultee. If they object, then a public enquiry must be held. 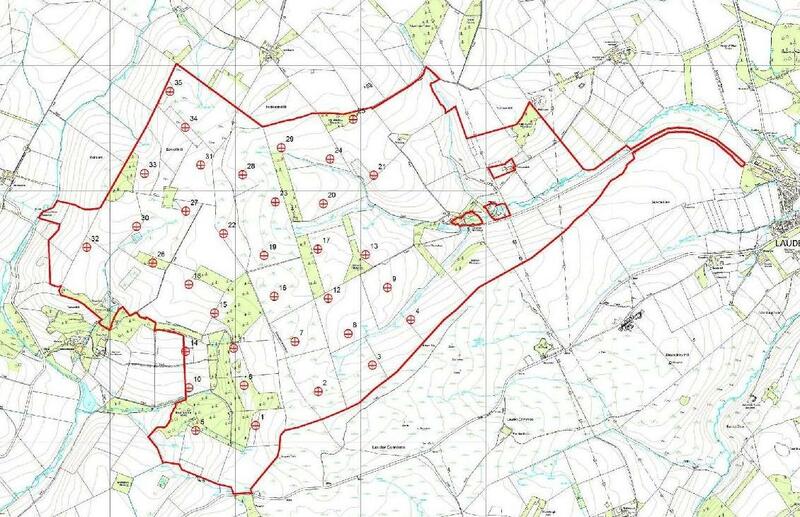 This is a quite horrifying proposal, not least because there are several properties within 1000m of turbines which would experience unacceptable noise.